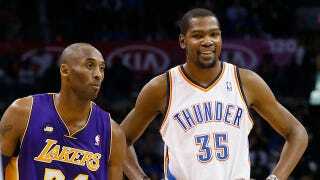 Last night, the Oklahoma City Thunder decimated the Los Angeles Lakers. Not only did the home team hang 122 on the Lakers, they bullied their way into the paint for 52 of those points and racked up another 22 on fast breaks that left Los Angeles gasping and ragged. L.A. surrendered 37 points in the first quarter, and allowed the Thunder to come within three points of cracking 100 before the start of the fourth. At halftime, OKC was on pace to score 142 points. Near the end of the game, the Lakers followed up a brief, hopeful run that cut the lead to five by going scoreless over the final six minutes of the game. The only thing Dwight Howard accomplished all night was getting himself punked by Serge Ibaka, and Kobe Bryant's gritty 30-point effort was overshadowed by the fact that he spent his night on the defensive end of the floor chasing after Russell Westbrook's first step. The Lakers looked old and overmatched all night, and the game was a stark reminder that despite their recent success, this team is still miles away from being competitive against the Western Conference's top teams. In a loss in OKC, the Lakers showed Tuesday they can compete against the West's elite. Will they get a chance in the postseason? What? In what way did last night's game prove that the Lakers can "compete against the West's elite" other than demonstrating that they are indeed capable of wearing basketball uniforms and making basketball plays while a much better team runs them off the court? Let's pretend that it had been the 28-31 Trailblazers who lost by 17 to the Thunder last night while relying on a one-armed, aging star to keep them in the game. I doubt they would have been declared legitimate competitors for the top spot in the Western Conference the next day. The Lakers are chasing the Thunder just as much as they're chasing the Rockets, Jazz and Warriors. This isn't just about making the playoffs; it's about doing something when they get there. "I think if we get a chance to play these guys again [in the playoffs], I think mentally we know that we can compete with them, and if it happens, hopefully we're at full strength and we can have our full team out there," Antawn Jamison said. "I like the mindset of the team right now. We're still fighting." That last line may still prove true, but we don't need to pretend like last night was proof.